WHAT IS drone technology innovation? The global market for drones is rapidly expanding as the wide-ranging applications of this technology are being uncovered and put into practice. 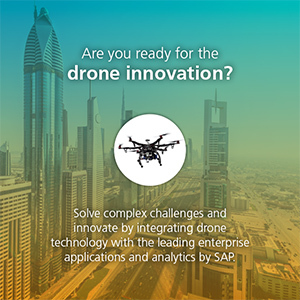 By forming a partnership with Exponent Technology Services Clariba is able to help its customers solve complex challenges and innovate by integrating drone technology with the leading enterprise applications and analytics by SAP. How can your organization BENEFIT FROM DRONE TECHNOLOGY? Many organizations depend on costly, labour-intensive and cumbersome functions for asset tracking, inspection, surveillance, mapping, maintenance, distribution and many more. By leveraging the mobility of drones for data acquisition via onboard sensors, cameras and other portable capabilities, your assets can be counted, measured, mapped, inspected, etc. cost effectively and in a fraction of time compared to conventional methods. The integration of this rich information within your SAP ERP / CRM enterprise systems and its visualization via actionable dashboards can give your organization a strategic advantage while reducing operational expenses. WHAT USE CASES ARE THERE and how do we get started? What counts is how this technology and its integration to your enterprise systems can benefit your organization. To get started contact Clariba and we will work with you to build the business case with our FastTrack Methodology following a Design Thinking approach. how DO WE INTEGRATE drones WITHIN your ENTERPRISE? From a technology perspective, drones acquire structured and unstructured data using a variety of on-board sensors, ranging from video, IR, and UV cameras to radio and WiFi antennas. By utilizing SAP real-time integration technology, data is streamed and integrated into SAP HANA Cloud Platform SAP HCP - a high performance in-memory analytics engine - where it is processed, prepared, and analyzed. This rich data is then available for integration within your in-house enterprise applications, can be analyzed with SAP analytics applications, and further enriched and classified with automated predictive models built in SAP Predictive Analytics. Business users can perform data discovery and build their own visualizations in an easy-to-understand and straight-forward way on a single, integrated, enterprise-level SAP Business Intelligence platform and consume the visualizations with their device of choice (laptops, desktops, smart phones, tablets, etc.) to produce actionable insights and facilitate the decision-making processes. Get in touch with us for more information about the Drone technology innovation.